Talking about stress management can come off intrusive so the interview began with high-level topics such as job responsibilities, workday walkthroughs, ways and tools used to communicate with co-workers, their work environment and workspace. I then dug deeper and asked how they managed their well-being during a busy day, as well as, what hinders their productivity. I ensured the questions asked were not leading to avoid framing biases. A proto-persona for Adriana’s company, KonektRx was created to paint a better picture of her situation and give a deeper understanding of why she’s currently overwhelmed. 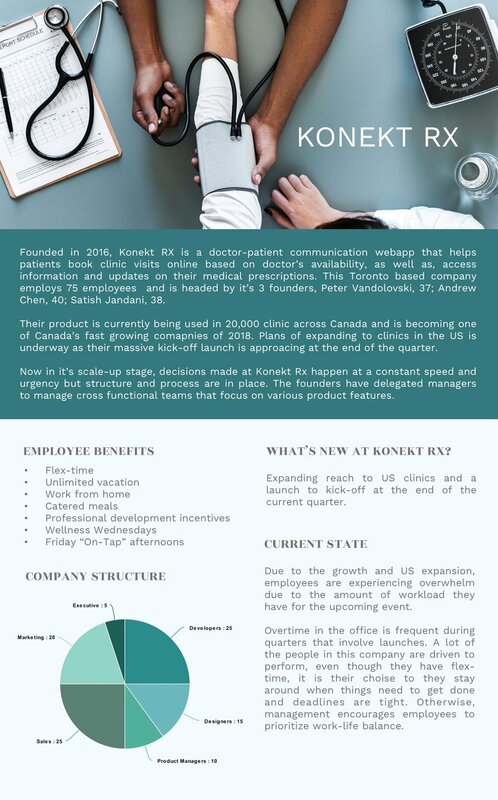 She’s supporting a huge kick-off launch in the US and KonektRx is hammering up for it. From all the data gathered, user stories were established to reflect the tasks Adriana would hope to accomplish in order to be more productive and less-stressed at work. Similar tasks were then clustered into the following epics which became the basis of the product’s key features about to be designed.